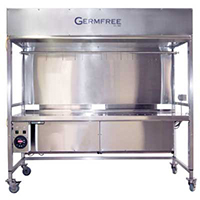 Germfree manufactures a wide range of innovative laboratory equipment to protect your personnel, your products and the working environment. 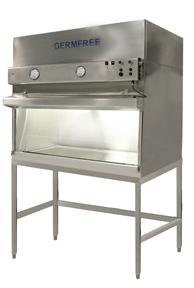 We offer Class I, II & III Biological Safety Cabinets (BSC), Fume Hoods and other laboratory safety enclosures. We offer standard models as well as customized units engineered to meet the specific requirements of your application. We also specialize in the integration of equipment and components into any laboratory, cleanroom or biopharmaceutical environment. Germfree is internationally recognized as a leading manufacturer of Class III Biological Safety Cabinets. 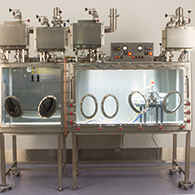 Our Class III Gloveboxes provide containment for diverse research applications in the most advanced ABSL-3, BSL-3 and BSL-4 laboratories. Our Class III BSCs are engineered to exceedingly rigorous standards for work that involves dangerous pathogens or unknown agents. We specialize in custom integration of all laboratory components. Germfree manufactures Class II Biological Safety Cabinets (BSCs) including standard Class II, Type A and Type B units and Custom sized units. Class II BSCs combine product, operator and environmental protection for a wide range of laboratory and biopharmaceutical applications. We also offer Portable and Transportable units designed for mobile lab and field use as well as custom sizes for larger processes and Robotic Safety Enclosures. 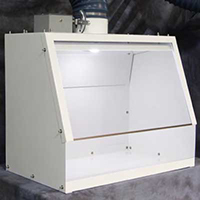 Germfree engineers and manufactures specialty and custom fume hoods for the safe handling of chemical fumes and volatile compounds for a range of laboratory, cleanroom and industrial applications. Our units are designed for your process requirements taking into account your facility and existing HVAC system. We also manufacture spot/source-capture filtered cleanroom models and Class I, Division 1 explosion-proof electrical components. 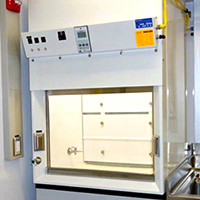 We provide Class I Biosafety Cabinets and Laboratory Safety Enclosures. These include Downdraft Tables and systems for weighing and transferring non-sterile powders and compounds. Our Ventilated Workstation (VWS) was developed in partnership with the Stop TB Partnership, WHO, the Union, FIND and the CDC. Germfree's Laminar Flow Workstations and PCR Cabinets offer a high degree of localized control for critical processes, providing a sterile environment for the handling of materials. The work area is continuously bathed with ISO 5/Class 100 HEPA-filtered air to protect the product from contamination. These units are constructed of high quality, all-welded stainless steel with a pharmaceutical grade finish.